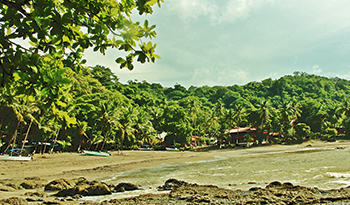 Tambor—Peaceful Beach Community on Nicoya’s Inner Coast. Rolling green hills, quiet beaches, and peaceful waters make up the scenery in this small, largely uninhabited corner of Costa Rica. With a desirable location on the tranquil Bahia Ballena, locals know that life is best enjoyed when taking things slow and that dinner tastes best when it was caught fresh that day. A nearby golf course, tennis courts, and nature reserves ensure residents get their fair share of activity, too. It's worth noting that while real estate activity has skyrocketed in other areas of the Nicoya Peninsula, little has been built in Tambor to date. Some lots have been cleared by major developers, only to be left undeveloped, perhaps in response to the Great Recession or as a result of overzealous building activity in other Costa Rican communities. Forest-covered mountains provide an excellent backdrop for beachfront living in the Tambor area. If a nature retreat up in the mountain sounds better, that vision can easily be accommodated here as well. When designed well, luxury homes can be tucked away into the curves of the mountains, providing ocean views and peaceful, isolated living. Investing in Costa Rica can certainly be a fulfilling and enjoyable experience in the Tambor area. Those looking for shorter-term accommodations will find that there are numerous vacation rentals available. Upscale neighborhoods sprinkled throughout the area offer families and groups comfortable living with easy access to the ocean.